Pumpkin spice mania has gripped the nation, flavoring everything from coffee to candles. While I do enjoy a scoop of pumpkin ice cream that appears seasonally at the Original Swensen’s ice cream shop, there are actually plenty of other sweet flavors that signal the holiday season. There’s gingerbread, cranberry, cinnamon apple, eggnog and peppermint to name just a few. Here are some holiday flavored things to eat and drink I’ve come across lately (my favorites are indicated with a ❄). Talenti Gelato makes a few "seasonal only" flavors as well as some others that are also nice this time of year. ❄ Peppermint Bark is a seasonal only flavor combines thin crisp flakes of semisweet Belgian Callebaut chocolate with a bright creamy peppermint gelato. This is ridiculously good. I cannot get enough of it. Either stock up or avoid it because once you try it, you will be hooked. $3.50 per pint at my local grocery store. ❄ Fudge Brownie gelato is for anyone who likes chocolate; this is a hit. It’s a rich chocolate ice cream, but with bits of rich and fudgey chocolate brownie in it, small pieces, but just enough to make the gelato even more chocolatey and delicious. So good! Thankfully it’s available all year long. About $3.99 per pint. I love the flavor of eggnog, I even use it things like pancakes. Old World Eggnog gelato has that very custardy flavor rich with eggs, vanilla and nutmeg. I like it, though not as much as the Peppermint Bark or the Fudge Brownie. It’s another limited seasonally available flavor. Suggested retail price is $4.99-5.99 per pint. Pumpkin Pie gelato has brown sugar, cinnamon, nutmeg and pumpkin plus pieces of pie crust. I found this flavor heavy on the spice and I’m not a fan of pie crust in my ice cream so this one did not win me over. It’s only available until December 31. Suggested retail price is $4.99-5.99 per pint. Caramel Apple Pie gelato is another gelato with pie crust, just not my thing. This also has a lot of caramel flavor that competes with the apple flavor. I guess I like my gelato more simple and pure. About $3.99 per pint. 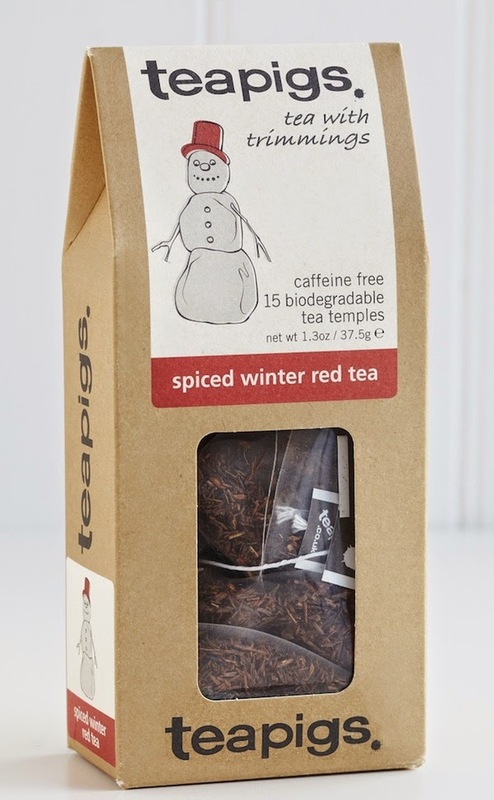 ❄ Spiced Winter Red Tea is called tea, and it comes from a company called TeaPigs, but there is no actual tea in it. Winter Spice Red Tea is mainly the herb rooibos, with orange peel, ginkgo leaves, orange blossom, cinnamon, ginseng, cloves and safflower petals. I’m pretty crazy about it. The spices are well integrated not overpowering but warming. It’s particularly good with milk and needs no sugar. DAVIDsTEA has a huge selection of blends—with herbs, flowers, spices. They have over 150 varieties and blends, and you can smell or even try any one you like at a Davids Tea shop. Some have green or black tea but not all of them. Some also use artificial flavorings, so do check the labels if that’s a concern. 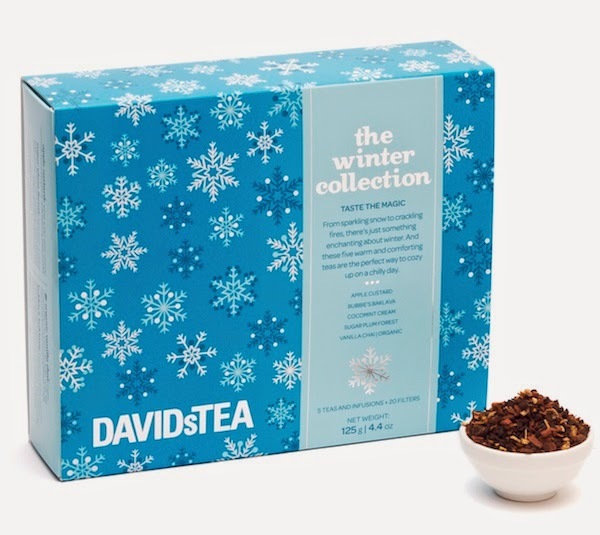 They offer different teas each season, the Winter Collection is available individually or in boxes with 3 or all 5 for $27.50. ❄ Apple Custard is a fruit infusion with apples, golden raisins, coriander, chamomile and a hint of vanilla (both natural and artificial flavoring). It’s a good tea to use in a cocktail. It’s nice to have a holiday flavor that doesn’t include cinnamon for a change. ❄ Bubbie’s Baklava is an oolong tea with roasted chicory root, pineapple, papaya, cinnamon, walnuts, apple, ginger, roasted almonds, cardamom, rose pepper, pistachios, rose blossom, artificial flavoring. It somehow manages to have the richness of baklava. It’s a really fun tea. I was surprised at how much I liked it. I can imagine it made into a wonderful simple syrup to use in drinks or with desserts. Cocomint tea is another fruit infusion. It includes apple, coconut, sweet blackberry leaves, peppermint, spearmint and natural coconut flavoring. It's fruity and neither the coconut or the mint really come across. Let's just say it's not my cup of tea. Sugarplum Forest is a rooibos based tea with apple, hibiscus, ginger, licorice root, raisins, cinnamon, rose hip peel, plum, cardamom, star anise, bruised pepper, cloves, chili pieces, and artificial flavoring. It's fruity with a subtle chili kick to it. It will tickle your throat! Don't over brew it. Vanilla Chai is an organic black tea with cinnamon, black tea, licorice root, ginger, vanilla and natural vanilla and cream flavoring. All chai is different and Davids Tea makes quite a few including Chocolate Chili Chai, Pumpkin Chai, Cinnamon Rooibos Chai and Saigon Chai with cinnamon, ginger and cardamom. This one is more traditional but with plenty of spice. 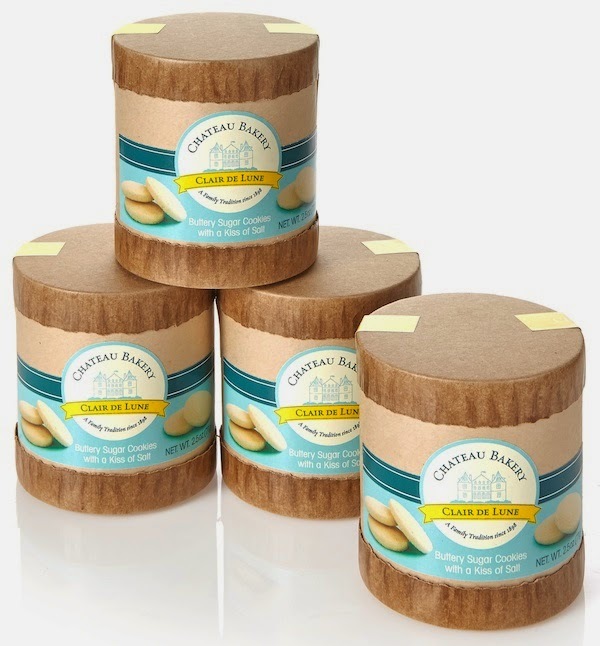 ❄ Chateau Bakery Clair de Lune Buttery Sugar Cookies are ridiculously buttery and simply divine! They pair so well with holiday flavored ice cream or tea that I just had to include them. I know many people like to bake cookies this time of year, but I challenge you to make cookies as good as these! They are made with nothing more than cane sugar, flour, butter, salt and vanilla powder. They positively melt in your mouth. You can get them in a handsome large box for $25 or four small boxes for $16, which would be perfect to tuck into a gift basket. I can’t think of a nicer hostess gift than either a pint of holiday ice cream and cookies or holiday tea and cookies. Can you? Disclaimer: My thanks to Talenti Gelato, Davids Tea and Chateau Bakery for providing samples for me to review. I was not monetarily compensated for this or any other post.